Netizens were shocked when photos of 2NE1's CL started circulating. In the photos taken at the airport and subsequent live performances, it shows a clear weight gain. Many netizens were supportive of the change, but there were also those that speculated she was unwell and thus gained weight. An "exclusive report" states she's not sick, but it was simply the move that caused the weight gain. Allegedly she wasn't able to practice and exercise as much as she was used to when living in South Korea. CL moved to the U.S. in the spring of 2018, but has been flying back and forth to Asia for scheduled appearances. It was also suggested she was under stress due to a discord between her and her label, YG Entertainment. This was also deemed untrue, and not the reason for any weight gain or change in her appearance. In other news, CL is making her acting debut in the movie "Mile 22", which is released in the U.S. on August 17th. 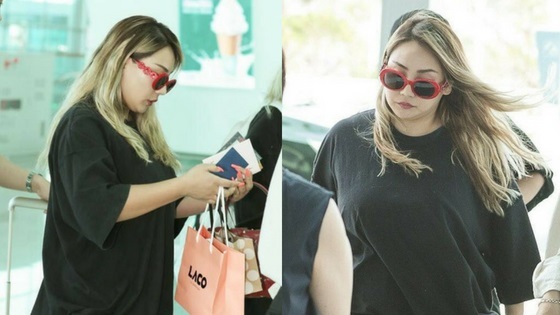 What do you think about CL's weight gain?